Specialty: Customer designed logic arrays and Integrated Circuits. Designed and manufactured the 555 timer and other semi-custom Monochip analog integrated circuits and gate arrays. Hans Camenzind, founder of Interdesign Inc.
Interdesign Inc. was founded by Hans Camenzind who left Signetics in 1971 to form his own IC design company. 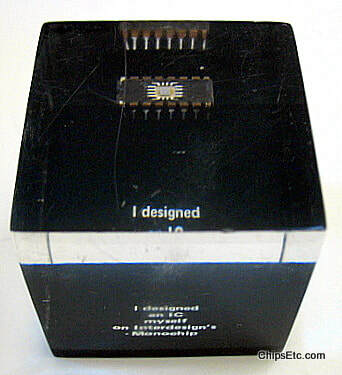 Interdesign was one of the first semiconductor companies to focus exclusively on the design and manufacture of semi-custom integrated circuits which they sold under the trade name Monochip. Interdesign was purchased by the Ferranti of the U.K. in late 1977 and merged with Plessey in 1988. 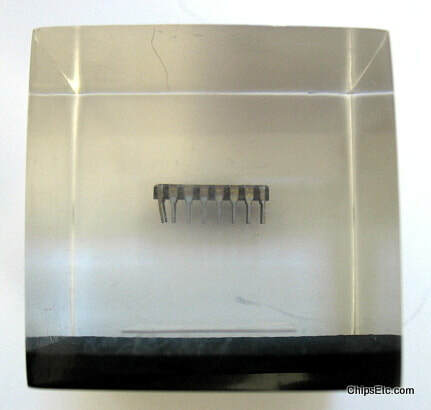 Fourteen sided Lucite paperweight measures 2.75" wide and contains an Interdesign chip in plastic DIP packaging with Interdesign logo stamped on top, no other markings on chip. 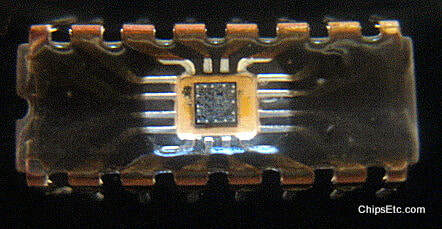 This Lucite paperweight contains an Interdesign Monochip in DIP packaging with the silicon die visible. 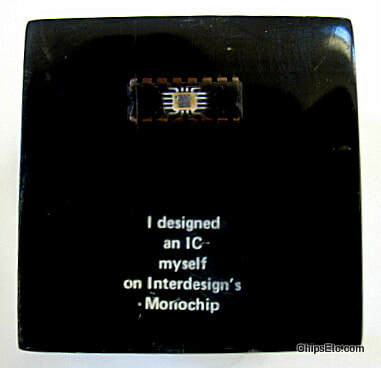 Reads "I designed an IC myself on Interdesign's Monochip". In 1975, Interdesign would create a fund to support non-profit groups in need of Custom Integrated Circuit Chips for use in medical electronics, research and education, offering them Interdesign products and support for free. 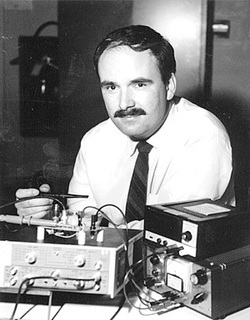 The fund was named after James V. Ball, Interdesign's Vice-President in the mid 1970's.